As "dirt dwellers", a walk on the beach is as close as we get to being back at sea. Layla is still “on the hard” (on boat stands) at the Beaufort Marine Center. We are tolerating life on land as “dirt dwellers” (from Eileen Quinn’s song, Dirt Dweller) in our house in Morehead City, NC. It is time now to catch up on what we have been doing. After the hurricane season passed, we had a decision to make. Should we put Layla back in the water and head south again? 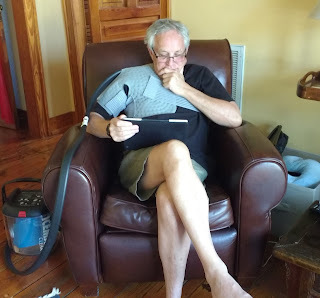 Our cruising friends had urged us to join them to cruise the Bahamas and other parts of the Caribbean this winter and spring but Bud’s increasing shoulder pain pushed us to another plan. Bud had injured his shoulder early last spring when he attempted to start a reluctant dinghy motor in Charleston. 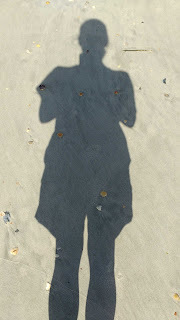 His shoulder had improved sufficiently to continue our travel down the coast and to the islands and back. However, a MRI scan in December confirmed he had a torn rotator cuff (the muscle and tendon that attaches to the head of the humerus) and to repair this would require surgery, as well as, several months of recuperation. Although this procedure is now done arthroscopically, the shoulder comprises complex anatomy and demands a lot of time and therapy for full recovery - MONTHS! hooked up to a re-circulating ice bath. It has been four weeks since the surgery and Bud is doing well with physical therapy and light activities. (You can hear him singing Amy Winehouse’s song “I don’t want to go to rehab, NO, NO, NO” as he heads out the door). Thanks to all for your calls, notes, and best wishes. Somewhere after leaving the Abacos on the Gulf Stream crossing, we each arrived independently at the same decision on what to do now. We were thrilled that we had really done what we worked so hard to do! Many friends and family had told us they "envied us for living the dream” and that we they were living the adventures through us. We had saved our money, quit our jobs, sold a house, gave away belongings and treasures, bought a boat, spent our money, worked our butts off, sailed into sunsets, cruised for months along the coast and across “the stream” to islands with turquoise waters to adventure and wonderful people. Without question we knew we wanted to EXPAND our life of travel. However, now after many months of extended cruising on Layla, we wanted to critically review life on a boat. Layla is a true “blue water” cruising vessel. She was made to cross oceans. We chose Layla specifically for her sea worthiness and we worked diligently to make her as sea-going as possible. Layla did not disappoint. However, we started to consider some shortcomings of a mono hull boat and whether a different boat, specifically, a catamaran, could enhance our cruising life. From spending time with friends on their cats we observed that catamarans offered a number of desirable attributes we should consider. 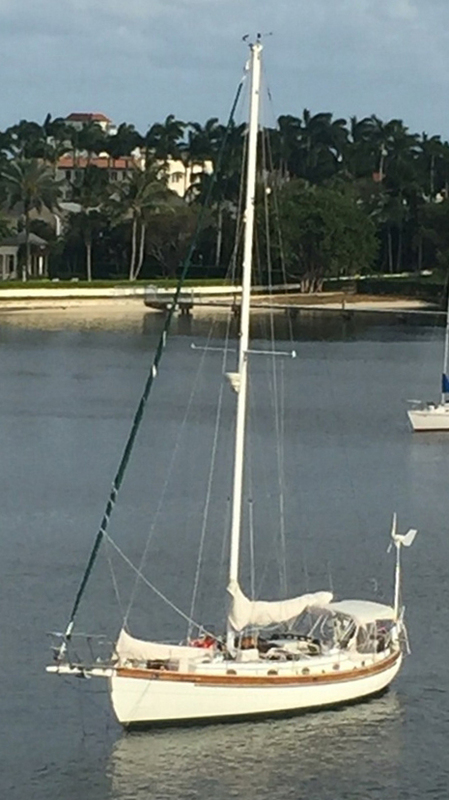 Among those attributes include: a shallow draft to allow access to safe anchorages closer to shore, easier access to deploying and retrieving the dinghy, redundancy with 2 engines, improved speed in light winds, more livable outdoor space, more comfortable interior, and more space for entertaining. Don’t misunderstand - we love Layla. The thought of selling Layla after all our efforts to get her cruising ready, is gut-retching. This is complicated. The decision has less to do with any shortcomings of the mono hull, but it has more to do with how we want cruise. We understand there is no such thing as a perfect boat. Catamarans have their own disadvantages including: they don’t sail as close into the wind as a mono hull, they can be more difficult to find dockage and haul out facilities, they are more susceptible to windage, and are MORE expensive. 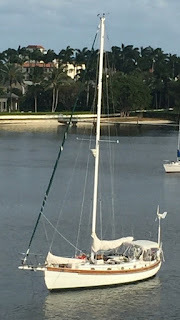 But for us the advantages of speed, stability, shallower draft, ease of boarding, dinghy handling, cockpit and living space, redundancy, and maneuverability make a catamaran more amenable to the extensive cruising we want to explore. Our big challenge now will be to be patient with the process – to find the right owner for Layla and the right catamaran for us. We have had mixed feelings when we observed other cruisers putting their boats up for sale. You know the adage – "the two best days in the life of a boater are the day you buy it and the day you sell it". For us, those are not, and never will be, the two best days. 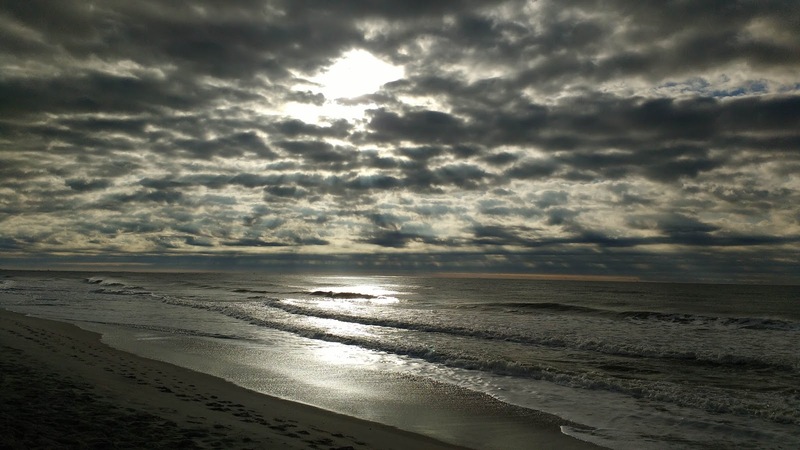 Walks on the beach aids Bud's rehab and our staying connected to Mother Ocean. There is no question that Layla is in the best shape she has been since we bought her. We understand she is not a boat for everybody. We hope someone will find her beautiful lines, expert craftsmanship, heavy displacement, classic looks and sea-kindly motion to be irresistible. She is worthy of all the attention she demands. She is a joy to sail and always invites complements as one of the most beautiful vessels in any harbor or marina. We are sure she will make someone very happy. She is that rare boat that is really ready to cruise now. Every sailor deserves to own a boat like Layla, at least once in their lifetime. We are fortunate to have spent six wonderful years with the girl. Layla always turns heads in any harbor. Oh my! It seems like you have made your decision and I'm sure it wasn't easy. Layla was your teacher. She made you work harder than you thought you would and in the end you found you needed to take another step beyond what she could offer. It is the journey after all. So here's one of those stupid questions, will you be changing the name of the blog when the time comes? Difficult decision to sell Layla, but we are confident we are making the right decision for us. Layla has been an excellent teacher. We will miss her. As for the name of the blog, that is difficult. We love Layla's name - it is short, easy to say and spell over the radio, and is just cool. The next boat may also be a Layla!